Found east of the Rocky Mountains, this sturdy, distinctive Russula bruises reddish brown on all parts. 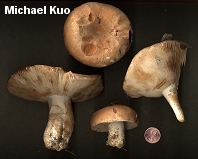 The cap is initially almost white, but discoloration soon begins, and mature specimens have reddish brown shades. 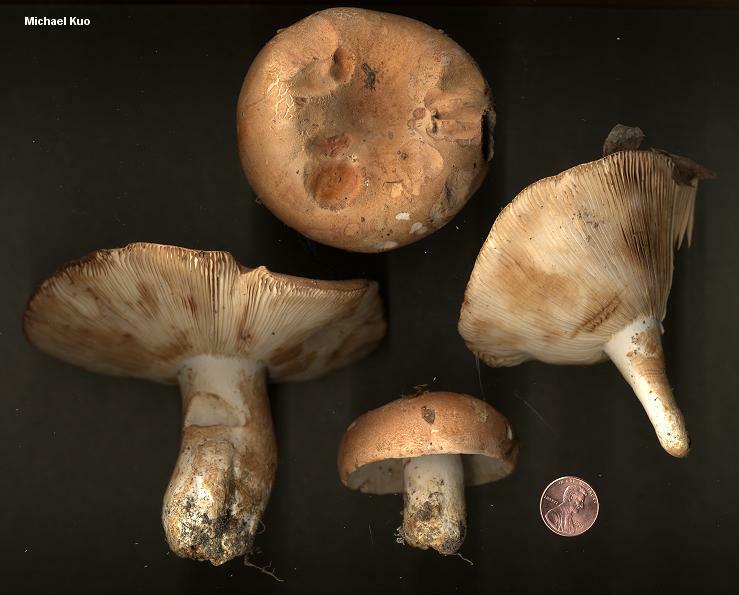 Russula compacta has a characteristically foul odor which becomes stronger as the mushroom matures, and dried specimens positively reek. 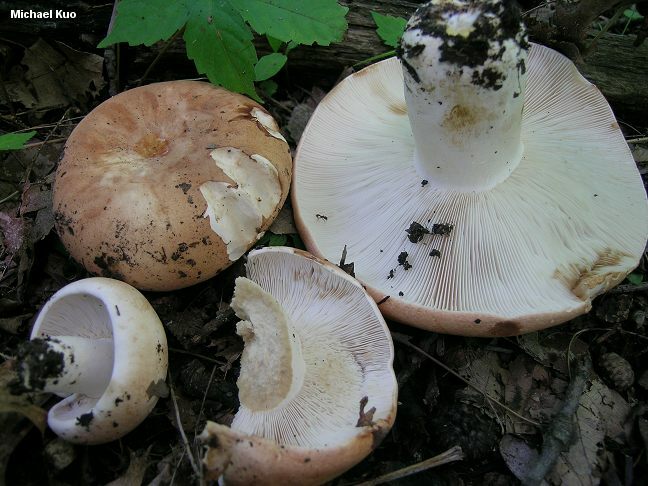 The smell lacks the sweet component found in the Russula foetentula species cluster. Ecology: Mycorrhizal with hardwoods, and with conifers in northern areas; growing scattered or gregariously; summer and fall; east of the Rocky Mountains, with range extending as far south as Costa Rica. Cap: 3-18 cm; convex when young, later flat or broadly convex, often with a slightly sunken center; sticky when fresh; more or less smooth, the cap "skin" peeling about halfway to the center, sometimes breaking up in age; white to whitish or orangish yellow when young, but soon discoloring dirty yellowish to reddish brown, and in age appearing completely tawny brown; bruising reddish brown; the margin not lined. 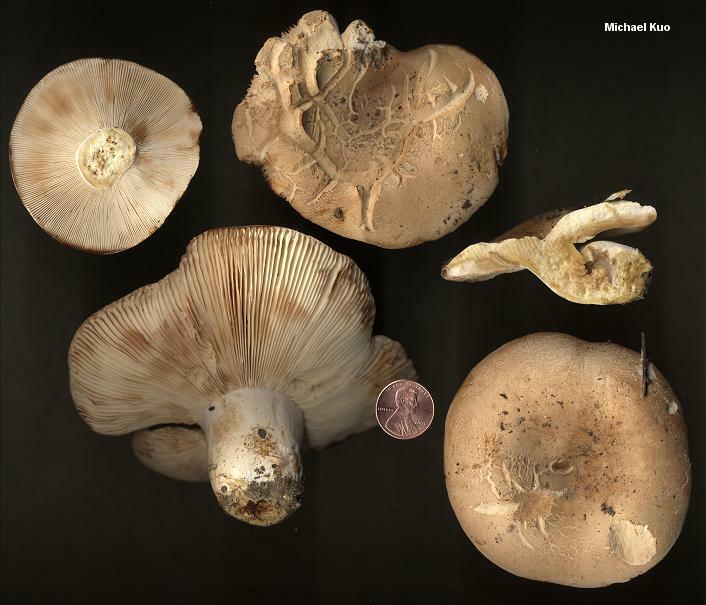 Gills: Attached to the stem; crowded, close, or almost distant; white to cream, eventually yellowish cream; bruising and discoloring reddish brown. Stem: 3-10 cm long; 1-3.5 cm thick; sturdy; more or less equal; dry; smooth; whitish, but soon flushed reddish brown; bruising reddish brown. Flesh: White; discoloring yellowish to yellowish brown or reddish brown on exposure; thick. Odor and Taste: Odor foul and somewhat fishy, the pungency increasing as the mushroom ages; odor of dried specimens strongly unpleasant; taste mild or slightly acrid. Chemical Reactions: KOH on cap surface green to olive. Iron salts on stem surface and flesh grayish green. 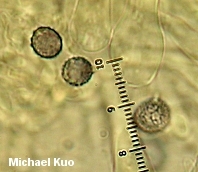 Microscopic Features: Spores 7-10 x 6-8.5 µ; elliptical; ornamented with low warts extending to about .5 µ high; with scattered connectors that sometimes form partial, broken reticula. 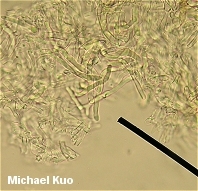 Pleurocystidia clavate to fusiform; abundant; negative in sulphovanillin. Pileipellis a cutis; pileocystidia absent. REFERENCES: Frost, 1881. (Saccardo, 1891; Burlingham, 1915; Beardslee, 1918; Kauffman, 1918; Shaffer, 1970; Smith, Smith & Weber, 1979; Weber & Smith, 1985; Kibby & Fatto, 1990; Phillips, 1991/2005; Lincoff, 1992; Metzler & Metzler, 1992; Roody, 2003; Halling & Mueller, 2005; McNeil, 2006.) Herb. Kuo 07220322, 07300301, 07020705, 07080708, 06280802.